A number of Canadian players are seeking to manage registries for the Internet’s new generic top-level domains (gTLDs) that will significantly open up the Web’s real estate. At present, there are only 22 gTLDs such as .com and .net available to register as a Web site, and 280 country-code domains as well (such as .ca). But the Internet Corporation for Assigned Names and Numbers (ICANN) is introducing new addresses in a bid to increase competition and choice. The application period for the new registries opened Jan. 12 and closed on May 30 after a delay due to technical problems. Though registering a Web address is cheap for consumers, applying for one of the new registries could cost up to $2 million. ICANN charges $185,000 for the application fee and charges $25,000 annually. But add ancillary costs such as running the registry backend and legal fees, and the cost quickly balloons. In a surprise to some registry operators, Regina-based Merchant Law Group LLP has applied for eight domains, including .App, .Art, .Blog, .Club, .Home, .Law, .Love and .News. The firm is known for representing high profile class-action suits in Canada, including a case against Facebook that was settled last year. It has also taken action against HSBC Mutual Funds, Winners/Homesense, and against incumbent cell phone carriers for charging a system access fee in 2004. 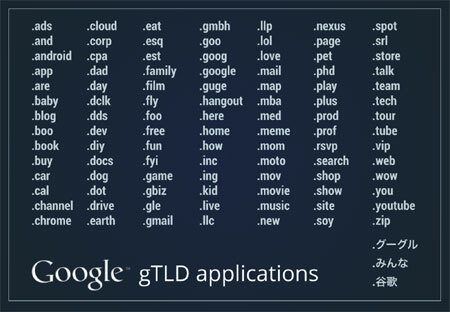 Google’s released a list of all the gTLDs its applied for. The firm was originally considering a dozen applications, says Evatt Merchant, managing partner of the firm. But it pared back its choices to eight. Its experience running a precision business that must protect client information as a law firm will be an asset, he says. The firm will also be working with CentralNic Ltd. as a partner on the new registries, relying on the registry agent to run the technical backend while the law group focuses on marketing activities. So why did the law firm feel the need for .Love? Only one couple can register JaneandJohn.com, Merchant says, so the idea is to offer more options to host a Wedding invitation-style site. Plus, the domain suffix makes it more appealing than a .org or .net for weddings. Tucows TLDs Inc. has applied for four of the new registries, including .Group, .Marketing, .Media, and .Online. The Toronto-based firm is a familiar brand-name in Canada and internationally, building a popular Web site of shareware and freeware in the 1990s. The firm also operates Hover, a domain registration service in operation since July 2008. Tucows opted for strings that were versatile and could present an opportunity for its channel of Web hosting firms to sell to small business customers, he adds. Tucows conducted research and found these key words were used for a variety of reasons on the Web. Many of the more generic domain names are contested. For example, Merchant Law Group faces a battle against Google for the .app and .love domains. ICANN is asking different groups vying for the same domains to negotiate amongst themselves first, but will eventually hold an auction to deteremine a winner for contested strings. Other familiar Canadian names can also be spotted on the gTLD applicant list. Rogers Communications has applied for .chatr, .fido, and .rogers. Shaw Cablesystems has also applied for the .shaw domain name. Federated Co-operatives Ltd., which runs the Co-operative Retailing System in Western Canada, applied to run the .crs registry. ICANN called the new gTLDs “one of the most significant developments in the history of the Internet” at its unveiling event in London today. It says it’s received more than 1,900 applications for the new registries.